According to the Agency for Healthcare Research and Quality, all hospitals must offer a voluntary, anonymous way for staff to report on incidents or adverse events, including near-misses, such as medication or treatment mix-ups that are caught and fixed. If submitted consistently, these reports reveal incident trends over time, which can help hospital higher-ups target recurring problems throughout the hospital that need addressing. In a perfect world, every incident at a hospital would be reported, logged, and addressed. Yet many adverse events go unreported for a number of reasons. Lack of time and busy schedules. Some of the busiest hospital personnel--namely nurses and doctors--are usually responsible for filing adverse event reports. As might be expected, busy and overworked hospital staff sometimes fail to report these incidents. Full schedules, lack of communication, and more pressing responsibilities can keep doctors and nurses from submitting reports in a timely fashion--or even at all. Lack of admin follow-up. According to a 2006 study, the biggest barrier preventing doctors and nurses from reporting incidents in hospitals is a lack of follow-up. Not knowing what (if any) action occurs after filing an incident report can make reporting feel meaningless and unnecessary. Over time, it can deter hospital staff from taking the time and effort in the first place, especially for non-dire problems such as a medication mixup that was corrected just in time. Lack of pain-free reporting. Overly long and complex forms also deter hospital staff from consistently reporting incidents. It can be difficult for doctors and nurses to take the time to fill out and submit a report when every second counts. Because of this, many hospitals have begun looking into ways to make the reporting process easier and faster for their staff. While hospital reporting systems have historically been paper-based and required manually filling out and submitting forms, more and more hospitals have introduced electronic reporting systems, allowing personnel to make reports online. Going paperless can speed up the submission process, reduce printing costs for the company, and save time for everyone involved. Issuetrak can help. Having a reliable, easy-to-use, and hassle-free incident reporting software in place can go a long way in increasing the number of incidents reported by hospital staff. With Issuetrak, it’s easy to keep doctors and nurses in the loop and follow up with them after their report has been addressed. When a staff member submits a report in Issuetrak, it becomes an issue that alerts the appropriate people to look into the problem. Hospitals can automate follow-up emails to send as the report moves through the evaluation process, keeping the staff member who reported the problem in the know. Issuetrak also makes the reporting process easier and quicker-- important for employees who often have little time on their hands. Hospitals can customize forms as much as they want. They can shorten the length of their forms, pre-fill certain fields, provide options from a drop-down menu, and even allow staff to file reports on mobile devices. On the other end, administration can view the reports at the touch of a button, or analyze them via the dashboard to help visualize and pinpoint common and important problems. 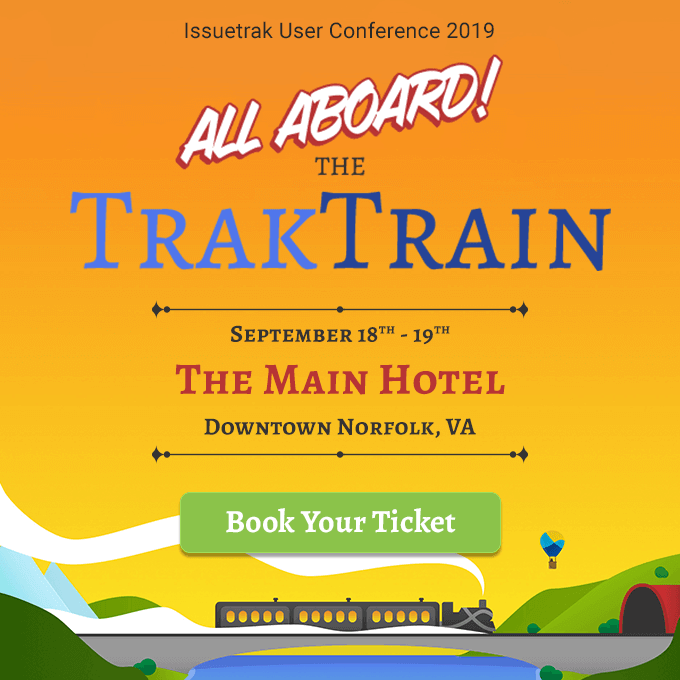 If you’re interested in seeing how Issuetrak can make incident reports faster, easier, and more organized for your organization, talk to one of our product experts today!